Today’s Warsaw (IN) Times-Union newspaper features on its front page a story about the hailand missions trip recently completed by a group of Grace College students led by Scott Feather. Here is a short excerpt. To read the entire story, click here. WINONA LAKE – Grace College students recently had the challenge of teaching students at Ramkhamhaeng University, Bangkok, Thailand, how to speak English while serving on a missions trip for two weeks. Thirteen Grace College students participated in the missions trip June 15-29. They assisted Thailand Campus Crusade for Christ students and missionaries Christian and Bonnie Beuggert in teaching English to Thai students. The Beuggerts are missionaries with Grace Brethren International Missions, and are both Grace College alumni who live in Thailand. All students at Grace College are required to serve seven days in the United States participating in a cross-cultural experience, or seven days outside the country serving before graduating. 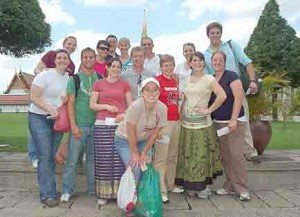 Scott Feather, dean of the chapel and global ministries at Grace College, oversaw the group in Thailand. Feather has taken students to Japan in the past, but this was the first time he took students to Thailand.